Water reclamation facilities utilizing anaerobic digestion have tried a variety of techniques to utilize the methane gas produced by their digesters to produce reusable energy. However, the use of engines or microturbines is costly, maintenance intensive, and often unreliable. Electratherm has developed the power+ generator to provide a low maintenance, cost effective source for utilizing excess biogas. The power+ generator ties directly into your existing anaerobic digestion facility. Your existing boiler will burn all the methane gas produced by the digesters assuming the boiler has the capacity, which most do because the boiler is typically oversized. 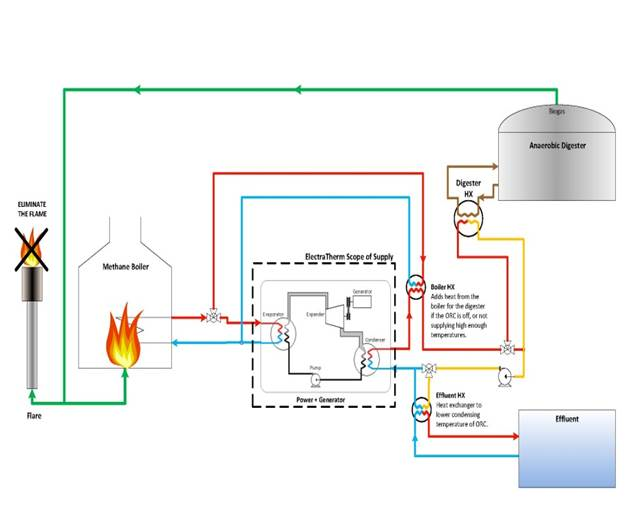 When heat is required by the digester, the hot water produced by the boiler will be sent to the digester. When heat is not required by the digester, hot water will be sent to the power+ generator. For facilities that want to produce power all the time with the power+ generator, an integrated solution as shown below can be implemented. Your existing flare will be eliminated as all excess gas will be used by the boiler to send hot water to the power+ generator. For facilities already utilizing engines for energy production, the power+ generator can be installed to utilize the waste heat from the exhaust and cooling water jacket for additional power production. Facilities with sludge dryers and incinerators can also use the waste heat from these operations to generate power with the power+ generator. Working fluid is pumped to higher pressure and transferred to the evaporator. Heat captured by the evaporator boils the working fluid into pressurized vapor. 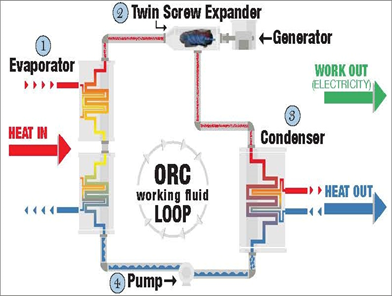 The vapor flows through the twin screw expander, spinning an electric generator to produce power. The vapor is cooled and condensed back into a liquid in the condenser to repeat the cycle. Easy to implement and operate. The power+ generator does not require any type of gas conditioning and utilizes the same boiler as is already installed at most anaerobic digestion facilities. Necessary connections include four water lines and power. The electricity produced by the system is utilized right at the plant and does not require being sold back to the grid. The power produced will reduce both the plants peak demand as well as its baseload usage. There is no need for expensive electrical switchgear to utilize the power onsite. The system is completely automated. 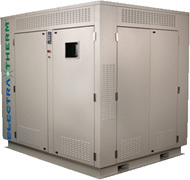 You can learn more about the Electratherm power+ generator by visiting their website at www.electratherm.com, visiting their youtube page at https://www.youtube.com/user/ElectraTherm, or by contacting your local Pelton Environmental sales engineer.